You're looking forward to making egg salad and you've boiled up a pot of eggs. Thinking you'll whip it up quickly. Because, hello? Egg salad IS really easy and quick! That is, unless your eggs don't peel easily. Then it turns into a half hour or more of pure frustration. You end up with more egg white on the bits of peel instead of on smooth hard-boiled eggs. This is Angel's issue as well. “How do I make easy to peel hard boiled eggs?” she asks. I'm sharing my thoughts below in today's #AskWardee. 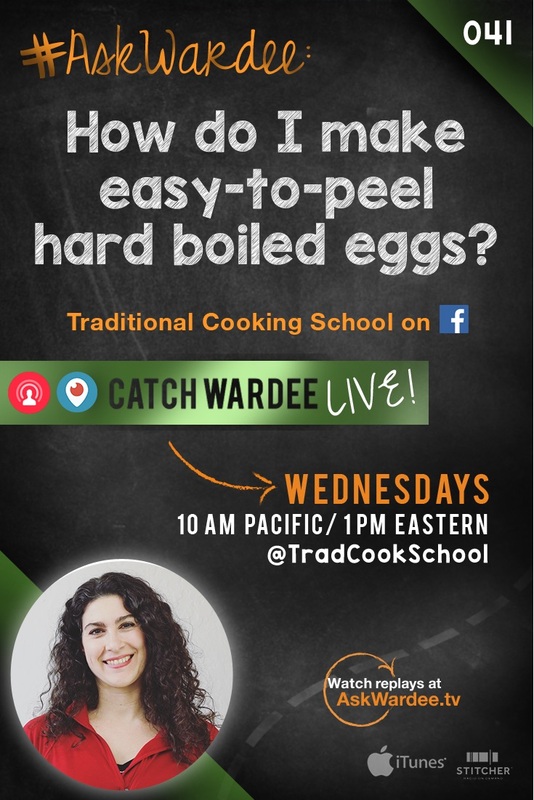 I’ll show you the easiest, best way to hard boil eggs that peel great every time. First, though, let’s talk about why fresh eggs that are hard boiled are so notoriously hard to peel. Why Are Fresh Eggs Hard To Peel? In fresh eggs, the albumen (white) sticks to the inner shell membrane. As the egg ages, the albumen sticks less and the egg white also shrinks slightly. This change makes eggs easier to peel. You have 3 basic options (plus more, I'm sure). Well, you can let the eggs age and they’ll peel better naturally. You can try various methods on the internet that involve vinegar or baking soda. These don’t always work, in my experience. Or, you can pressure cook your eggs. Yes! Pressure cooking works. Easy to peel eggs every time, no matter their age. See method below for doing it simply and easily in your Instant Pot. The method is simple. I make a pot of pressure cooked hard-boiled eggs at least once a week in my Instant Pot. 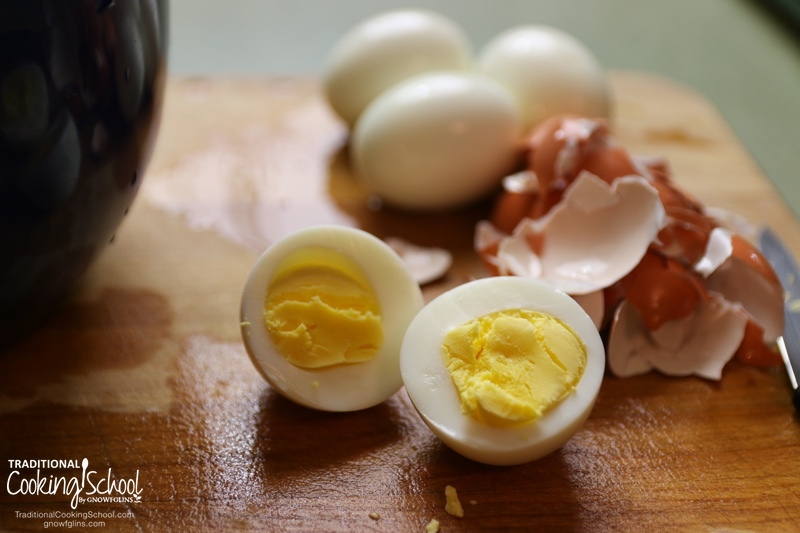 Hard boiled eggs (especially easy to peel ones) make great quick lunches and snacks! Put a cup or 2 of water in the bottom of the Instant Pot pressure cooker, along with the trivet or a steamer basket. Stack fresh, raw eggs on the trivet or in a steamer basket. 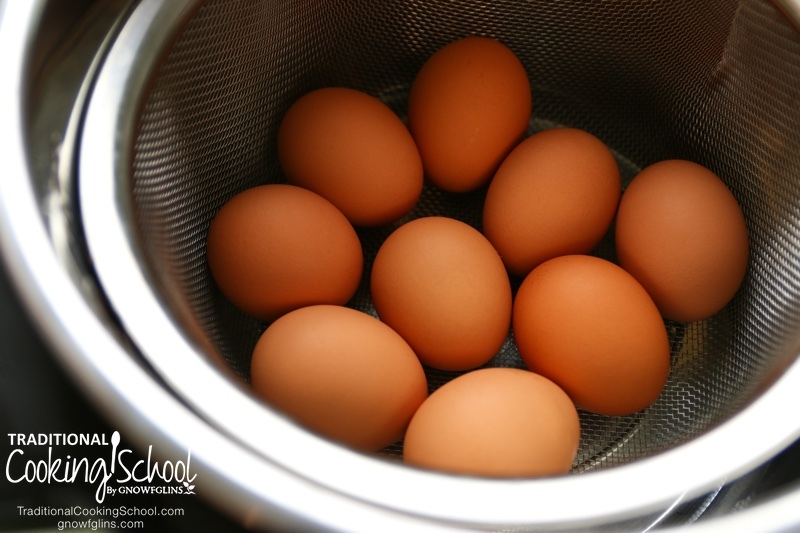 I use a steamer basket like this so I can do up to 18 eggs at a time! Put the lid on the Instant Pot and check that all the parts and seal are in good condition and the sealing valve is in the sealing position. When it beeps that it’s done, leave it alone on the keep warm cycle for another 5 minutes. Keep watch on the timer it will count the 5 minutes for you. Release pressure quickly by switching the sealing valve to the venting position. 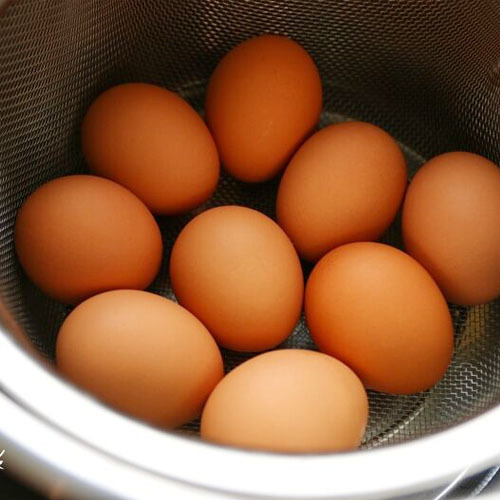 Remove the eggs and immediately plunge them in cold or ice water to cool down fast. Peel and eat. See how easy they are to peel? Or refrigerate for later. For more information, see my Pressure Cooking eBook & Video Package. Just released this week! Includes dozens of recipes and 5 Master Class Videos. How do you make easy-to-peel hard-boiled eggs? Any tips? I love hard boiled eggs! But I always made my husband cook them because although I consider myself a pretty good cook, I hate babysitting the eggs, so I would lose track of time and have either darkened egg yolks (over cooked), or runny egg yolks (unintended soft boiled eggs). But the Instant Pot changed my game! PERFECT hard boiled eggs, no need to baby sit them! I simply set them for 5 minutes, and I release the pressure as soon as the cooking time is done. I do the ice bath and they are perfectly yellow, and only one time there was a tiny runny area inside of one the yolks. I love it so much, that now I want to make hard boiled eggs all the time! I have a power pressure cooker XL, i do have a manual option but it’s chicken/meat, fish/ veggies steam, beans / lentils, rice/risotto, slow cook, soup/stew and canning/preserving. So which one do I choose?? Ps. Can’t tell if your eggs are water, I just have a tray w holes that keeps what your cooking from submerging…. Is that ok?? We’re not sure on this particular machine. You’ll want to contact her manufacturer to ask them how to do 5 minutes on high pressure in your machine. Want to try without the special steamer basket. I can improvise, but nowhere do you mention water…do you put water in the IP before placing the eggs on the steamer tripod? Thank you so much! I tried this tonight and it worked out unbelievably well! On 9 eggs, not a single bit of white went into the sink when I was peeling the eggs. I have never before been that successful with peeling hard boiled eggs and not peeling off some of the whites. I think I will try one minute less on keep warm next time, because there was just a bit of gray on some of the whites. But I will definitely be using this method for now on. I’ve found that the 5 minute Natural Release gives my yolks a greyish tinge, so I reduced it to 3 minutes. But wow, are they easy to peel! I have a pressure cooker but not an instapot. Is there another method without the appliance? You can use your stove top pressure cooker. 5 minutes on high, 5 minutes natural pressure release, release the rest of the pressure. I don’t have an Instant Pot or a pressure cooker. How can I get hard boiled eggs to peel easily when cooking them on a stovetop? Cooking was easy, fast, predictable … no watching. But peeling? Pretty much the same as our old method. Lots of divots in the eggs.